You’ve connected with a prospective client and you’re at your first meeting! It’s an exciting time in the life of any freelance marketer or copywriter. Unfortunately, this is also the moment when the seeds of disaster are often sown. Instead of having a detailed discussion about the project at this initial meet, hungry copywriters often slump into desperation mode. At the first mention of a payment of any size at all, you’re sticking out your sweaty hand ready to shake on any deal you can get. Remorse sets in later, when you figure out the project requires ten times the workload you imagined. If you accepted a flat project fee — always preferable to naming an hourly rate — you realize you’re earning less on an hourly basis than you’d get working the counter at McDonald’s. Avoid this unpleasant scenario by learning all you can before you agree to take a project. There is a lot to know to really nail down what a copywriting assignment will entail. 1. Can you please define your project? You might imagine a company that’s called in a copywriter has an idea what they want. Much of the time, you would be wrong. They’re hoping you can help them figure out whether their best new piece of content would be a white paper, a revised landing page, or eight blog posts a month. If they can’t figure it out even with your help, try to find a small initial project they’re willing to greenlight to get things moving. 2. When will you be ready to get started? If the answer is “next fall,” you know this is just a meet-and-greet. This client isn’t ready to assign anything, so politely wrap it up as fast as you can and ask if you can stay in touch. 3. When do you need this project completed? Between question two and this one, you learn the timeframe — how long you’ll have to do the work from start to finish. This is one of the most important metrics I use in setting my bid. If the timeframe is short, remember rush work should always pay a premium rate. 4. Is there a hard deadline by which materials must be delivered? For instance, if what you’re writing is to be handed out at an upcoming trade show, there won’t be any wiggle room. 5. Have you worked with freelance copywriters before? Pray the answer is yes. Training a client who’s new to the whole process will be time-consuming. 7. Who will be my editor? This is the person you’ll spend the most time interacting with, so try to meet them and get a sense of whether you’re compatible. 8. How many people at your company will be involved in this project? Many executives or departments on board can mean an ugly scenario in which your work is reviewed by multiple managers or department teams. This is usually the enemy of good copy, and can make consensus on a final version hard to achieve. 9. If multiple executives or teams are involved, who has final approval? Push to define where the buck stops. Otherwise, it may stop with no one, or you may find yourself enmeshed in a power struggle may between several executives who each think the project is theirs. 10. Will I be interviewing people outside the company? If so, find out whether the company will provide contacts or you’ll be expected to dig them up yourself. 11. Who will come up with the topic(s)? A corporate blogging project where you need to generate a dozen ideas a month takes far longer, and should cost more, than one where you’ll be handed a monthly topic list. 12. May I see your existing marketing materials? One of the best ways to cut the time you spend on a copywriting project is to read existing materials to learn what their marketing team likes. 13. Oh — you hate your current marketing materials? If current materials are loathed, it’s even more important to get a look at it. Ask managers what’s not working for them, so you can avoid putting more of the same in your copy. Also, identifying crappy existing copy opens the door to negotiating additional project work. 14. Will what I’m going to write be used with your existing materials? If your brochure is going to have one of their existing fliers tucked inside, you’ll want to know that from the start. 15. Who, specifically, is the target audience for what I will write? If the company doesn’t know, beware. 16. How much can you tell me about this audience? Extract every detail you can, down to what brand of coffee their customers drink. The more developed your picture of customers, the easier it will be to ‘talk’ to them in your copy. 17. What are the most important problems facing this audience? If the company is fuzzy on this point, talk to sales staff about what they hear from customers, or arrange to spend a day going out on sales calls. 18. Have you done any market research on your customers? If there’s a study sitting around, get it in your hands. 19. How, specifically, does your product or service help solve their problems? The answer to this question may deliver an instant outline of the points you need to cover. 20. Can you provide me with five descriptive words that define the values you’d like me to convey about your company? This little exercise is invaluable to get prospects to crystallize their corporate values so you can clearly communicate them in the copy. 21. Who are your major competitors, and how is your company different? This is your chance to learn that essential element your copy will need to highlight — the client’s unique selling proposition. 22. How will this material be distributed? Online content has a distinctly different format than print, so find out if links need coding. 23. Are you looking for a graphic designer on this project? If so, stand out by offering to tap your rolodex, and possibly also score a project-management fee. 24. Do you have any multimedia needs for this project? In today’s interactive age, you may need to integrate QR codes, video, slideshows or other interactivity into what you write. Understand all the moving parts up front. If you have experience with these tools, you should think about raising your fees. 25. May I show you some of my writing samples? Bring a portfolio or tap your website as a way to stand out in the client’s mind compared with other writers. 26. What is your preferred method of communication? If the answer is IM or Skype, be wary. Customers with a fondness for IM may want to message you instantly — around the clock. 27. What is your expectation of my availability? This is another way of teasing out whether 24/7 communication is expected. If you cherish your weekends off, make that clear and set your boundaries now. 28. Are you looking to lock down my time exclusively? Some clients want you to drop everything and work only for them until their project is completed. You may or may not be able to clear those decks. This question can also bring up whether the client might put you on an ongoing retainer if they like this first project. 29. If my piece will be published online, may I get a credit that’s a live link to my writer site? This is especially relevant if you’re blogging or writing articles for a company. Those bylines can be a great source of new referrals, so it’s worth asking. 30. Does this project require a nondisclosure agreement? Get clarity about what’s top secret, so you don’t screw up and blab something confidential. 31. Will I be allowed to use this piece as a sample in my portfolio? If you’re ghostwriting for team members and the company wants that fact kept confidential, it costs you a sample — so the assignment should pay a premium. 32. Are there any restrictions on who else I can work for in your industry? Especially beware of any noncompete clauses that extend beyond the term of your project. 33. What is your payment method? PayPal is increasingly common — but that service charges a fee that can be nearly 3 percent. If a company can pay through PayPal, in my view, they can pay via direct bank transfer at no cost to me. 34. How soon can you get me a 50% up-front payment to get started? Maybe you could accept 30 percent if you really love the project, but don’t start work without an up-front payment. 35. Let’s review the payment terms for the rest of my fee. Don’t leave this one vague, or the client may pay you six months after you finish work … or never. Right here is where a lot of cash-flow headaches are born. Ask for net 30 days from when work is turned in, or better yet, net 15. 36. My fee usually includes two rounds of rewrites. Does that work for you? I know many copywriters who stick to this rule, and any additional desired edits are extra. I personally take an “I work until you’re thrilled” approach. But it’s worth considering how to structure your contract, especially if you’re smelling a “gang edit” scenario. 37. Let’s determine the time limit for this project. Sometimes, a first draft gets turned in and then you never hear from the client again. In this scenario, your final payment will never trigger unless you’ve built a cutoff date into your contract, at which point all work is considered finished and your check is due. 38. When do you need my bid? If the project is complex or some questions remain unanswered at the end of the first meet, put off bidding until later. Go home and think it through, wait for the rest of the facts to trickle in, and then give your quote. 39. Are you meeting with multiple writers? This company might be thrilled to find you and ready to hire — or they might be emailing a list of the first 50 writers they saw on a Google search. If it’s a cattle call, you may want to put less energy into trying to land the business. 40. If you’re considering turning me down based on price, could you let me know so I can consider rebidding? If you’re worried about whether you’ve bid too high and you really want this client, this question could keep you in the running. 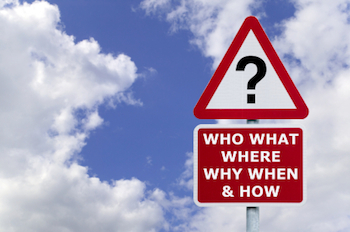 What are the questions you consider crucial for your clients? Do you have a varying version of one of mine? Leave them in the comments below and let’s talk! “Can you please define your project”. Great question and one that should be promoted with any prospect in any business project at the earliest opportunity. Project scoping and defining the boundaries are vital for success. If the scope is not defined it will end in two definitive results. 2. Your business losing money on the deal. If they can’t define what they want, then a simple scoping exercise can be done with you (which could/should be chargeable). You can always make it part of the overall price if they decide to go ahead with you. Scope is also a integral part of project management. Somebody should be running the project as a project manager – either on the client or the freelancer side. Barney, I have been there, done it. Like you said, when no project scope is undefined, then the client could ask for things which where didn’t specify from the beginning, and you work a lot more, for no additional income. If freelancers would use contracts or be upfront, nothing like that would happen. I will first ask the person to show some previous work & the budget as you rightly pointed out. Good list of questions. Thanks for writing it down Carol. As an SEO consultant, I’ve asked very similar questions. The biggest one is usually in regards to how much control I am allowed over their content. Will I be writing blog and articles, or will someone be doing that in-house? Do I have to get everything approved beforehand, or do they trust my judgment and expertise? How many people do I have to convince of an action before I am allowed to follow through? Sometimes you spend more time getting things approved than you do actually working on it! Great questions – and I’m happy to say that I ask most of them (sometimes some just aren’t pertinent to the client or project). I will say that I can’t agree that a fixed-price bid is always best. I do aim for fixed-price when I can, but if the scope seems open to change, I’d rather go with an hourly estimate, define the scope as tightly as possible, and set clear expectations that scope creep will affect the final cost. Sometimes (as you also point out) clients really don’t know exactly what they want. Trying to push them into defining it when they haven’t yet committed to working with me can be – reasonably from their perspective – annoying. It’s also often quite futile, because when someone doesn’t know what they want, they may need an example – something to shoot at, so to speak – before their wishes will crystallize into form. I guess what I’m saying is – everything is always flexible and dependent on the situation! Hi Grace — That’s why I say if they don’t really know, try to find a small initial project you can do for them. Sometimes you can do several smaller projects while the client is figuring out the big picture of what they want to do in marketing this year, and that keeps your name in front of the client and generates some income in the meanwhile. In actual practice, though, it’s a tad difficult to ask a client to define a “small initial project” when they come to me wanting a new website, but unsure about exactly what the pages will turn out to be. It’s usually a lack of full clarity around their business – and understandable enough; in my experience, relatively few people have that level of clarity about their business, and even people who’ve been in business over 20 years have told me they were much clearer about their real focus and strategy after we were done. It seems a bit inflexible if I insist that we have to nail down every aspect of their site before we start. I’d far rather give them a more broadly-defined, hourly approach. I’d also add that you have to be very, very good at writing tight project definitions if you’re going to work on a fixed-bid basis, and that’s a skill that takes time and practice to develop. I’ve been writing project definitions of all sizes – from a few $100 to half a million (literally) – so I’m relatively confident in my scoping and in my ability to write a scope document that both I and the client can be comfortable with. Boy, was this article ever timely! Thanks! Great post, Carol. Thanks for putting it together. Excellent, Carol. Thank you for posting these. I am going to print this out and keep it with me. This is a great list! I already ask many of these, but thanks to you, I now will be asking a lot more! The answers definitely helps define a clear scope of work upfront, protecting all parties. Carol, I often get phone queries about my copywriting and decline most projects simply because my rates are higher than what people are willing to pay. So asking the question about their budget is right near the top of my list. I ask only a few of these questions initially. If they’re still interested, we proceed to the next layer of questions. Asking them all means I could end up wasting 45 minutes and having nothing to show for it. I would rarely ask all these questions off a phone query, Joan. Definitely would want to be at a stage where I’m clear it’s a fairly serious prospect before gathering this many details. Couldn’t agree more – this is a fantastic list! 40 take an unrealistic amount of time to ask for some copywriter-client situations, so can you get it down to the Top 15 or 20 that one shouldn’t live without? Carla, in my business, I cover all of these questions, but in a more phased manner so it doesn’t seems like I’m grilling the prospective client or putting him/her in the hot seat. For example, I don’t initiate a discussion about my payment terms until we have determined that my skills are a good fit for the client’s project and whether I have enough free time to meet their expected turn-around time. I think it’s going to depend on the client and situation which of these will be the critical questions to ask. Carol, this is such a great list! I particurly appreciate questions #15 – #21, which are critical to delivering on-target copy. Although I don’t typically ask these types of questions up front, once I have “won” a copywriting assigment, I never move forward without gathering this basic product/client/competitor insight. Thanks for sharing. #23 is so important. I find that those who are new to working with a freelance copywriter may not think about the difference between copy writing and graphic design. If you don’t bring up design, you can find yourself delivering the prescribed copy and hearing the client ask when you’ll be putting it into the final format. I also ask: ‘What does your target audience currently think/feel/do and what do you want them to think/feel/do once they have read this brochure (or website, or whatever it is I’m going to be writing). Questions around tone of voice can open up a can of worms if they don’t have a clear concept of what their tone of voice is/should be. I was recently briefed by two directors of a company on what their tone of voice should be and I agreed to do two sample web pages to check I was on the right lines. They said it was spot on and so I wrote the full 12 pages. Then a third director got involved and said he didn’t like that tone of voice at all and made me rrewrite it to HIS specification. (Totally overruling his two fellow directors). That begs a further question: who needs to be in the initial briefing session? Having worked with a lot of creative pros and agencies from the client side, I can confirm that we used to do this to people all the time. (It wasn’t any fun for us either.) This is a critical one to get sorted out, and to make sure that you don’t get penalized for the company’s disfunction. #8 and #9 might not seem that important if you’ve never worked in an organization that has issues with power struggles, but they’re critical. Quite useful questions. Here i think that by discussing these question with client no confusion will occur later. Great article with some very pertinent advice. Thanks for writing it. Thank you. I wish I’d read this before meeting a new client. I have never been into copywriting business and I am not interested at all, since I am planning to stick with my blogging career and live my life as a blogger. Anyway, thanks for sharing these useful tips. “Let’s determine the time limit for this project.” Key especially if you work like I do ““ until you’re thrilled.” Plus I love #23. All copywriters should get to know good designers. Carol, I always loved articles like this. A lot of people pop into freelancing (writing, developing, designing, and etc) and they get “blind-sided” by clients that request too much of them. However, if they follow these 40 questions, they can prevent that from ever happening. Now think about it… what if you turned this into a 2-page document and offer it as a free download? People can refer to it before each and every client meeting. This is a fantastic post. I am going to hold onto this as reference for new client meetings. Without fail, there always seems to be something I forget to ask during those initial meetings. List like this certainly come in handy. And the beauty of a compilation like this is that it not only covers what you should ask of your clients, but what they should expect from you. Most times, the client will ask “Can you “insert project here” for us?” without fully realizing what a half-decent copywriter/designer/illustrator should be bringing to the table. These types of questions get the clients to look at their project in a different way. It’s always satisfying when a client leaves a meeting with a new perspective on their own project. I’m all for content marketing – that’s how I built my business as well. 3) You’re devaluing the methodology. This questionnaire should be EARNED while a trainee is working with a pro copywriter, or bought by a beginner copywriter who WANTS to get ahead faster. Guess I don’t agree, Gabor. This is exactly the sort of content I give away on my blog all the time. My mission is to help writers earn more, so I often describe exact ways writers can do that. I don’t think I’m devaluing methodology by discussing it. And as you can see from the comments above, not everybody agrees with my points anyway. I’m not worried about more competition, and I don’t think sharing methods creates more. It doesn’t give people the skills to DO great copywriting — it just allows copywriters to gain a better sense of what they should charge, and charge appropriately for the project’s true scope. Certainly flattered you think the list is of such high value that I should sell it. But most of my products for sale are much more extensive than this. I think putting forward this information gives copywriters better tools for demanding more pay. That strengthens the copywriting business and firms up rates for all of us, rather than diluting the value of copywriters in the marketplace. But happy to hear others’ thoughts about it. Carol’s enough of a pro to know that the market is always strong for good copywriters who are also good businesspeople. And we give away lots of stuff we could charge money for. 🙂 We’re asking for people’s time and attention — that’s much more valuable than any dollars they could give us. Great list of questions–I only wish you’d written this post two months ago! I was recently burned by a client specifically because I didn’t know the answers to Questions No. 5, 9, 16-20, and 27-29! I was hired by the business owner and spent weeks reporting directly to her for final approval–which she was slow to give, if she even replied to email/voicemail at all–when the person I was *supposed to be* reporting to thought I was a slacker for never talking to her! I eventually discovered, as the business relationship was rapidly dissolving, that the owner had no experience with freelancers, so she didn’t know that I thought I’d be reporting to her unless she told me otherwise. She didn’t know that freelancers don’t always take on one client at a time from start to finish; she basically wanted me to be a 24/7 employee available at her beckon call, whereas I usually work on multiple projects simultaneously. They also had no client profile what-so-ever, and how they present themselves in marketing is MUCH different than how they work behind the scenes. They are a very traditional business that wants to cast a wide net and get every possible person in a large area–they have a niche, but they want that niche AND everyone else. Thus, they wanted traditional marketing pieces–press releases with very “professional” (which in their culture’s terms meant traditional, nothing that could be considered out-of-the-box or unusual) images to go with it. Since I was brought on board to work with their online presence and create their social media program, I jumped in with behind the scenes photos, personal stories from clients, and applied all of the usual Web 2.0 community-building tactics that their marketing seemed to suggest they’d want. Unfortunately, they were still working with tried-and-true, impersonal methods of marketing–nothing in the first person, everything very stoic and rigid–so that the culture clash was too severe and they ended up going with a different freelancer to maintain what I’d built up until that point. If I’d simply asked the right questions, I’d have known from the start that the project was completely and utterly wrong for me. Of course, I’ve bookmarked this site and will integrate these questions into my new client questionnaire so I can hopefully avoid another bad experience! Company culture is such a tricky thing, and doubly so when you’re coming from outside. Thank you for your post, Carol. I’m fairly new to copywriting, and these sample questions will be a big help. I’ve noticed that finding reliable information about the interviewing portion of copywriting is almost impossible. Most websites discuss the writing aspects of the work and seem to gloss over the fact-gathering stages. As a writer, I find the interviewing process the most challenging portion of my projects. Could you recommend any further sources for information on the interviewing/fact-gathering processes? Awesome list! Definitely bookmarking this for when I do this type of work. Excellent piece. I am not a Copywriter but want to apply the 40 questions to other areas of work, be it internal clients or external customers we need to define scope and expectations of satisfaction. Lucky number 13 is my favorite on this list! I cant tell you how many time, early on in my copywriting career I forgot to do this. There is nothing worse than repeating the mistakes of your predecessor! What’s worse is finishing a TON of awesome content and being SO sure of your work, only to get a frustrated or even angry response from your client… and having NO IDEA what went wrong. The simple act of going over their current content to find out what they do/do not like and what they’d like to see done differently can save you from a serious headache. As an added plus, it shows your client that you can, and it gives them a chance to vent a bit. They’ll be grateful for both. Whoa boy, step #1 in your list is always one of my favorites. It is so true that you need to be able to define a project before making a request. At the same time, I always help nurture along the question, can you define your project, by having available brand questionnaire or web workbook to help people brainstorm and work through the process. I’m a fan of the written questionnaire approach too, especially for that initial phone conversation. Somehow, being confronted with a line on a form that says, “How many blog posts a month do you need?” helps crystallize an answer better than just verbally being asked. Hi Carol, thanks for the list. Definitely very pertinent. I also agree that it’s worth sharing. Hi Carol. Thank you for this very informative post. I need to find someone to do some copy writing for my business consulting website and your list will be a fantastic starting point to make sure that I have all the answers clearly in my head before an interview. Your post may have been directed specifically to copy writers but it will no doubt save a lot of problems on both sides of the fence. Fabulous post, thank you. And I guess that this epitomises the best of blogging – perpetuating the community feel, stimulating discussion, sharing your knowledge with others and doing so with intelligence and charm. This is great! I actually have a friend who will be in need of these questions. She is currently working with a client that is asking her to do things she never agreed upon, but this was because she rushed into it, she took them as a client and never asked, like you were saying. Thanks for the post..wonderful! This is wonderful and very practical. Some things like getting clips on your website I have already built in to my contract. Great piece! Thanks for this great piece Carol! I’m very new to the freelance business (so new that I still need to keep my day job). While I’m a technical writer rather than a copywriter, many of these questions are very relevant to what I do. I’m also trying to decide if copywriting is an area that I can move into down the road so I’m trying to take in all the knowledge I can from the experts to see if it’s right for me before I jump in. I appreciate that seasoned pros like you are willing to share these “secrets of the game” with the rest of us who are still learning how to play. I just added your blog to my feed list. I look forward to more great content. This is great. share your knowledge with others and do so with intelligence and very practical. That’s a very useful secret you have given out for free. It’s really a good action plan for freelance business. Thanks. I’m tacking this to my wall next to my computer and yes, this list will be in my hands during my next negotiation call for sure. I just wish info like this was available to me years ago when igot myself into some sticky situations with clients.